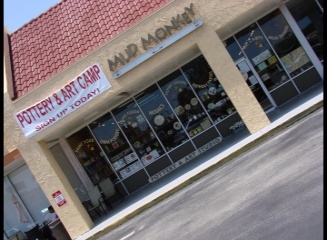 The Mud Monkey, make your own pottery and art studio is a fantastic indoor art place to discover your creative side you never knew you had. This studio is great for all ages! Kids will love this place to explore the many ways to creatively express themselves! On Wednesday nights, they have moms night out for the ladies, no children allowed! You can BYOB and they have free pizza! How fun is that! Sounds like a plan to me! Let's do it! There are so many fun things to do here, like paint pottery, play with clay, make mosaics, and fuse glass. I could see myself completely lose track of all time, and space, and responsibilities, working on a new piece of ceramic art here! Bryan had a great time glazing his ceramic race car to his hearts desire. The next step is firing in one of 3 kilns they have, which cooks the glaze on the clay at over 2000 degrees! What's left is a shiny, colorful, permanent keepsake of his great experience, to be picked up in 7 days! They also have freeform clay opportunities, and they have several potter's wheels to try your luck at spinning a pot, a plate, a cup, and more! The birthday parties and special occasion parties here are unforgettable. Everyone gets to create their own special ceramic memory to keep forever! Check out their website for more fun information on their very popular Kids Summer Art Camps!!! All Mud Monkey Summer camps include clay, wheel, fused glass, mosaics, pottery painting, a camp t-shirt, friendship, and fun!